To say Chris Matheson’s The Story of God is irreverent would be misleading: irreverent does not begin to cover it. Matheson sets out to be just about as offensive with this treatment of the god of the Bible as is humanly or divinely possible. Whether or not this book proves to be your cup of tea, you have to admire his commitment, not to mention his lack of regard for errant lightning bolts once word of his little book reaches the Almighty. The Story of God starts with its protagonist sitting alone in an expanse of nothingness, just as we find him at the beginning of Genesis, and proceeds to march through the whole long story of the Bible, covering God’s relationship with humans, Satan, and his own angels with ribald humor and sacrilegious glee. Beginning in Genesis and ending on the final notes of Revelation, Matheson’s book feels a bit rushed at 143 pages, but still manages to include most of the Bible’s major stories. At points, this rushed tone feels a tad sloppy, almost like Matheson was writing more of a long treatment for a screenplay than an actual book, and, in fact, screenwriting is where Matheson has made his name; he co-wrote the Bill & Ted movies and wrote the 2013 comedy film Rapture-Palooza, among others. The God Matheson paints in his book has cause to be self-critical: he’s a fool and a jerk. As we march through this take on the Biblical story (Matheson annotates his text with Biblical references to prove he’s not just making the weird stuff up–it’s in there) God’s character flaws quickly unfurl themselves and begin to make things difficult for the deity and his created beings. This god hates women when he regards them at all, he’s capricious and fickle in his dealings with humanity, he’s full of himself, he’s trivial and childlike in his pleasures, and he’s regularly outwitted by his nemesis, Satan (he can never remember for sure if and why he ever created the devil in the first place). The conversations between God and Satan are among the book’s highlights, hilarious back-and-forth dialogues that illustrate Matheson’s abilities as a screenwriter. It’s easy to hear the comic timing for these lines. Significant attention is given to the unfortunate story of Job, a man who was rewarded for his obedience to God with unimaginable grief and suffering, which was all so God could prove something to Satan. Yes, that part really is in the Bible, and Matheson focuses this tale as the crux of the broader narrative–the God of Matheson’s book never really had any idea how to love or be loved, and hurt his human creations from his own deep loneliness and self-hatred. It is in this story and in the threads that tie to it throughout the book that we get something like sympathy for this deity, a being who hurts others because he himself is hurting. His efforts to fix his mistakes only blossom outward into bigger messes. There is a touch of pity in Matheson’s tone, however lightly it might land. This God is more clueless than evil, though evil is as evil does. The book is, as I said, sloppy at points, and the Old Testament portion of the book, which takes up two-thirds of the page count, is much stronger than the New Testament portion. Things unravel quickly once Jesus shows up on the scene, and Matheson has trouble keeping his cheeky narrative together, especially once things really go crazy in Revelation. Still, the book is quite funny. If you’re not easily offended and aren’t afraid of freak hailstorms, check out The Story of God. 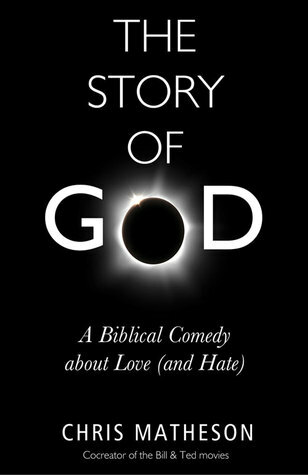 The Story of God is available now at GPL.